Subject: How to Book Ringing Bells Cheapest Phone Freedom 251 smart phone online booking. The Country's new what could revolutionise India's affordable smartphone market, domestic handset maker Ringing Bells is all set to launch India’s most affordable smartphone ‘Freedom 251’ for mere Rs 251. Bookings for the Freedom 251 will begin on February 18 at 6 am and close on 21 February at 8pm. The company says deliveries will be completed by 30th June 2016. Here's how you can book the smartphone. Go to the company's website http://www.freedom251.com/. You will see the booking option button on the homepage. you can do so early morning tomorrow when the booking starts.Freedom 251 with its inbuilt touchless technology is Ideal for perfect Selfie. For Selfie lovers life just got a little easier. Freedom 251 : Online Booking Starts From 18th Feb 6 AM onwards. Display Sreen: 4 inch (10.2 cms) qHD IPS display. . 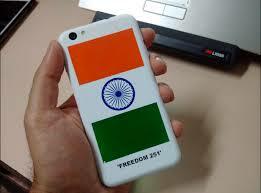 Processor: Freedom 251 comes with 1.3 GHz Quadcore Processor capable of fast and responsive performance. Battery: 1450 mAh battery, Freedom 251 gives you more time to talk, text, Play and watch videos without needing to worry about running out of power. Operating System : Andoid Lollipop 5.1. Service Centers: 650+ Service Centers in India.